A few years ago when I was in fairly handsomely rewarded employment I spent a year living in Candle House, the round building in Holbeck Urban Village which looks like a stack of pizzas. It was a great place to live, only a couple of minutes’ walk to City Square and the train station, another couple of minutes’ drive to the motorway system and with a fine selection of bars and restaurants on the doorstep. My favourite haunt was Vineataly where I would call for coffee and a bite should the mood take me. 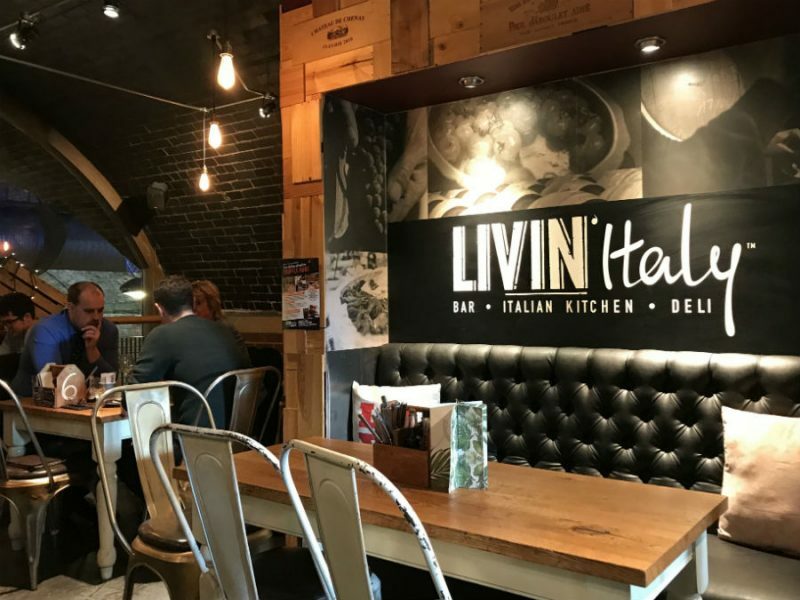 They had to change their name after another establishment of the same name got a strop on and it became Livin’Italy and styled itself as a Bar, Italian Kitchen and Deli. Fortunately, the casual vibe didn’t change. The reason I mention the above, apart from having to start my article somehow, is that I had arranged to meet an old, sorry, former, workmate for lunch and as they were coming by train I thought that this would be a good place to revisit. By using the new South Entrance to the station you come out in the dark arches about twenty yards from Granary Wharf, so before we knew it we were waiting to be seated. We were found a table for two in the upstairs room which, like the ground floor, is decorated in industrial chic style. They have also moved the Italian racing red motor scooter up here and it is displayed in the front window. Even though it was pushing two o’clock when we arrived the place was still fairly full with diners, and the buzz of conversation gave it a wonderful atmosphere. I wasn’t going to write about the visit as I thought that someone might recognise me from the days when I was a regular, but the staff had changed and the boss, Alessandro, was on holiday. On thinking back, it is over six years since I moved away so it is not surprising no one knew me. Not only has the staff changed but the menu has too and is now much more expansive. 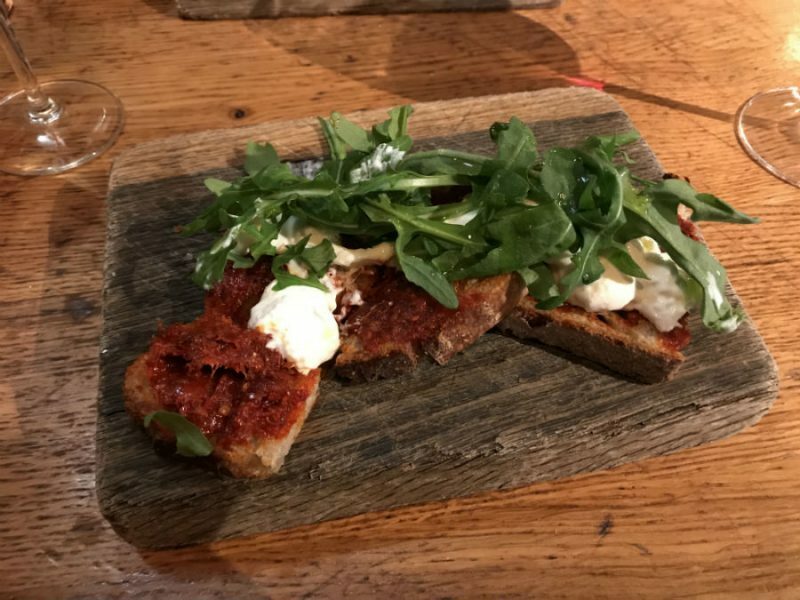 I began with Nduja, on crostini bread, topped with Stracciatella, a creamy mozzarella, then dressed with Rocket leaves (£7.50). Should you be unfamiliar with nduja it is a spreadable type of salami with added spices and a heavy kick of chillies, so approach with caution if you are not into hot tastes. 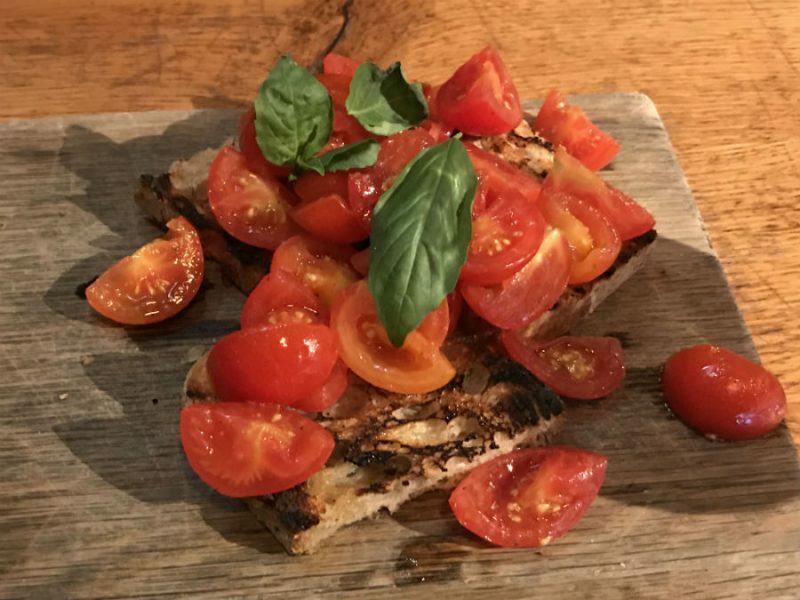 If that is the case you may prefer what my friend had, the Bruschetta Pugliese which is Friselle crostini bread topped with an abundance of cherry tomatoes, olive oil, garlic and dressed with fresh oregano and basil.(£5.95). The combination of fresh tomatoes and basil is a marriage made in heaven and this was divine. For our main course we chose from the Meat and Fish section of the menu. 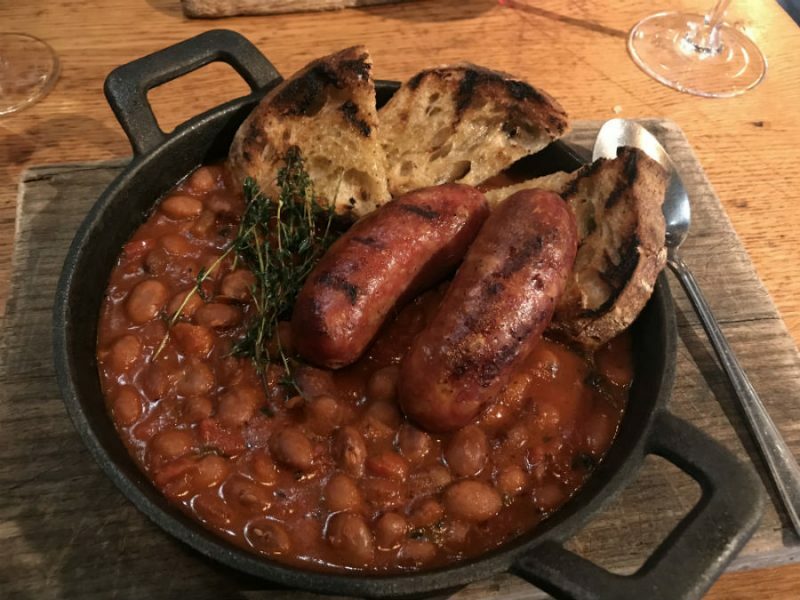 My choice was Braised Tuscan Sausage in Borlotti Beans served with char-grilled sourdough (£11.95). The taste was amazing and comfort food par excellence. The seasoning of the sausage turned the humble banger into something very special and the beans in their sauce were a million miles away from the canned variety, still having some bite to them rather than being cooked to a mush. I accompanied the food with an excellent glass of House Montepulciano at £6.95 for 175ml. 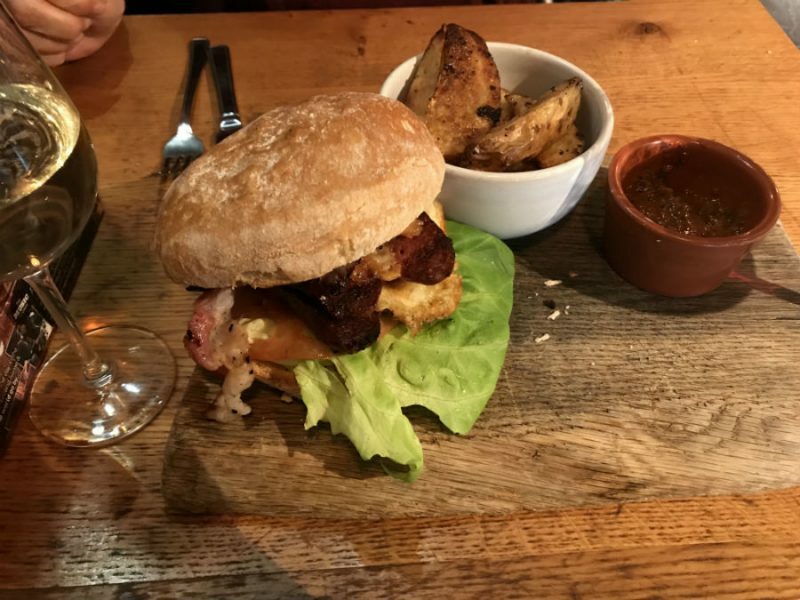 Tuscan Sausage was also my partner’s choice but this time in a burger which contained smoked cheese, crispy pancetta, salad leaves and a side of roast potatoes and spicy sauce. This came in at £10.95. As the dish was rather large the bun was stripped of its contents and unfortunately had to be left, but the sausage etc. was said to be very good; so good in fact that I wasn’t offered a taste! I was told, however, that I was welcome to the bun. Cheers mate. With no room left for dessert we decided to bid arrivederci to Livin’Italy and made our way back to the station. It is always a gamble returning to somewhere you knew and loved after all this time, but it was far from disappointing in this instance. The only disappointing part is that I can no longer afford to live in this, now salubrious, part of town with its huge range of facilities. On second thoughts, I am probably getting a bit long in the tooth for la dolce vita.